David Carr, owner of McGuire’s, held a champagne reception on October 9 to celebrate the relocation of the company’s Southampton office on County Road 39. Dave was joined by dozens of local business owners, town officials, employees and others. McGuire’s also has offices in Riverhead, Patchogue, Greenport and at Montefiore Medical Center in the Bronx. 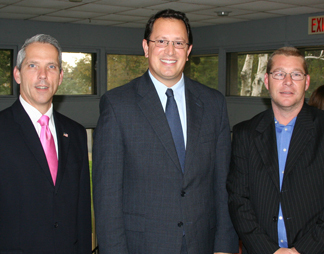 Southampton Town Councilman Chris Nuzzi (center) joins McGuire’s owner Dave Carr (right) and Town Council candidate Jim Malone (left) at the reception at McGuire’s in Southampton on October 9.